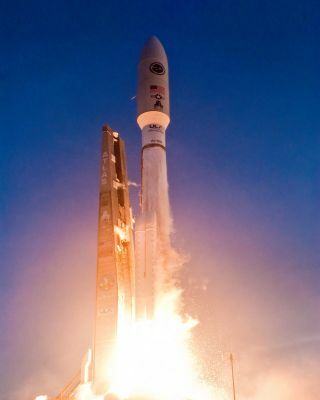 A United Launch Alliance Atlas 5 rocket with the Air Force’s Advanced Extremely High Frequency-1 (AEHF-1) satellite launches from the Space Launch Complex-41 launch pad of Cape Canaveral Air Force Station at 7:07 a.m. EDT on Aug. 14, 2010. The U.S. Air Force is gaining ground in its attempt to save anadvanced new military communications satellite after a crippling malfunction leftit without a working main engine. The Advanced Extremely High Frequency 1 satellite launchedsuccessfully Aug. 14, but suffered a main engine breakdown a day laterwhiletrying to perform maneuvers to raise its altitude in orbit. The 13,420-pound (6,100-kg) spacecraft is the first of threeto be provided to the Air Force under a nearly $6.5 billion contract withsatellite builder Lockheed Martin, Air Force officials have said. A series of smaller maneuvers using the satellite's smallerhydrazine thrusters have successfully raised it ?to an intermediate orbit. "The current status for the first five burns for theparking orbit has all been nominal and the satellite is performing asexpected," said Dave Madden, Military Satellite Communications SystemsWing program director at the Air Force's Space and Missile Systems Center. Madden told SPACE.com Tuesday that these thrusters areworking at 100 percent efficiency. The small thruster maneuvers came after attempts to fire theAEHF 1 satellite's stricken main Liquid Apogee Engine failed. The satellite'shydrazine thrusters deliver 5 pounds (2.3 kg) of thrust, compared with the mainengine's 100 pounds (45 kg). "We believe the LAE is unusable, and at this point wehave no plans to fire that engine again," Madden told reporters last week. Lockheed Martin engineers are ?working with the Air Force todevise a strategy to save the spacecraft's mission using these smaller enginesand a third set ofelectric ion thrusters that run on xenongas. Officials estimate it will take the satellite 10 months to ayear to reach its intended orbit 22,300 miles (35,900 km) over the Earth'sequator using just the smaller thrusters. Originally, the move was expected totake 90 days. The satellite must move to a higher orbit to complete itsfull mission, and also to avoid the hazardous bits of debris that tend to crowdthe lower altitude it is currently in. The satellite already escaped at least one close call with apiece of space junk, Madden said. "We have to watch out for other particles because we?rein such a low orbit," he added. "And so we actually fired our 5-poundthrusters to do a collision avoidance maneuver." Despite the challenges, Madden said he was "extremelyconfident" the spacecraft would be able to reach its intended orbit. "I am confident this next step has acceptable risk thatis anchored in sound testing, analysis and independent review, providing thebest chance at maximizing final overall mission capability," Madden saidin an e-mail. The AEHF-1 spacecraft is the first in a network ofsatellites designed to serve as a vital communications link between militarycommanders and troops, as well as with the White House. The AEHF system, withits large data capacity and fast processing rates, is intended to replace theaging Milstarsatellites. Before any more satellites in the series are launchedthough, the Air Force wants to figure out what went wrong on this one. "Understanding root cause is essential before movingforward with AEHF SV-2 launch plans," Madden said. That second vehicle was originally slated to launch inFebruary 2011, but now its liftoff will probably be pushed back to make sure itwon't experience the same problems as its predecessor.